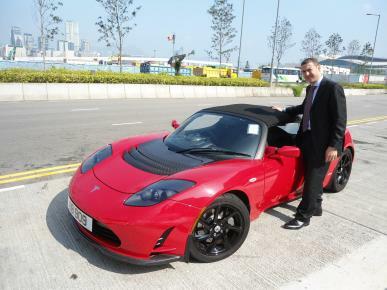 Classy, eco and smooth-words to describe the all-electric Tesla Roadster and the owner of one of these hot, attention-grabbing sportscars (one of 55 in Hong Kong and 2,500 in the world)-Karim Azar, General Manager of IFC Mall. Karim took us for a spin and what a gratifying thrill we had. Speedy as a bullet (the car can accelerate from 0 to 97km/h in 3.9 seconds) and quiet as a mouse (part of the reason why the back camera automatically turns on when in reverse mode to easily spot unsuspecting walkerbys), it was a bit awkward to get in and out of the car as the seats are so low, but the seats are so close to the road that you can get that extra rush of adrenaline when you step on the accelerator, especially on winding roads. Made entirely of carbon fibre skin, making it super lightweight, the Tesla Roadster shows real-time data on the barrels of oil saved on a user-friendly touch navigation system. We chatted with Karim more about why he loves his Tesla and his experience of owning an electric car in Hong Kong. Ecozine: How do you feel about driving a Tesla Roadster? Karim: I love it! It’s a great car and I drive it every day. Ecozine: Why did you choose a Tesla? Karim: From an environmental approach, a Tesla consumes much less than a conventional car. There are 55 in Hong Kong and mine was the last one available. When I did the test drive, I fell in love with it and got rid of my v10. I’ve been very happy ever since. 2500 have been produced with 250 of these right hand drives. Tesla recently launched a four door electric car which are available for purchase now for June delivery. It’s a more comfortable family car and it’s already sold out in the US. Ecozine: Which other cars did you consider before deciding on the Tesla? Karim: I also considered the Nissan Leaf and Chevy Volt, and the Toyota Prius. But the Tesla is technologically far ahead in terms of performance and quality of construction. 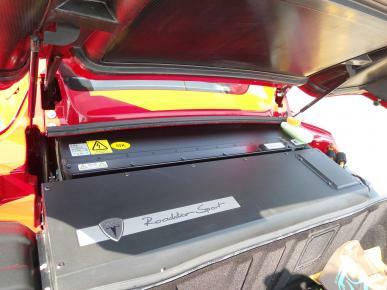 The body panels are from France and these were sent to the UK where Lotus builds the Roadster’s chassis and the fitting out and interiors are done by Tesla in the UK. Ecozine: Do you find it quite easy to maintain the car? Karim: Very easy-there’s no service or oil change needed. I don’t even need to go to the fuel stations any more. Gasing up is a thing of the past. The Roadster is extremely reliable. With a range of 300 miles, it’s way more than you need, especially in Hong Kong. Tesla is American owned, and there’s no agent in Hong Kong, so everything is transparent and easy. Ecozine: Do you experience any challenges in charging the car? It’s very easy to charge here in Hong Kong. I can charge them at the IFC, Star Ferry, or Hopewell Centre when I go home at night and I charge it every two or three days. Ecozine: How does the Hong Kong government encourage people to opt for electric cars? Karim: There’s no tax on electric cars in Hong Kong, whereas you need to pay 100% for other cars. For semi electric cars like the Prius, you pay less tax, around 50% or 60% but you pay 0% for fully electric cars like Teslas and it’s way for the government to promote electric cars because they realize all expensive the technology is. Ecozine: What kinds of incentives can businesses offer to help make electric cars mainstream? Karim: Businesses are offering free charging and car parking for electric cars to encourage people to go to their shopping malls or buildings. Car charging companies are working with developers to increase the number of charging stations in buildings. The Tesla comes with a slow charger which needs 10 hours to charge and you can also pay about HKD 45,000 for a fast charger which charges in four hours. Ecozine: If you could change something about the Tesla Roadster, what would it be? Karim: The boot space is not great, and the passenger seat isn’t comfortable. I’d also like to see better brakes. Ecozine: Being the owner of an eco-friendly car, what kinds of eco-friendly habits have you adopted? Karim: Owning an electric car has made part of my soul to become more eco friendly. I take shorter showers, and I’m more conscious of the power I use. My consumption has decreased across the board let alone fuel. I’ve turned into a power saving freak, because I want to be more economical with fuel, so my environmental impact is less.